The Stephen F. Austin State University School of Honors will host a lecture by its former director, Dr. Allen Richman, professor emeritus of history, at 3 p.m. March 13, in the McKibben Education Building, Room 131. Richman, the 2006-07 Regents Professor, will present "For Faith and Fortune - The Significance of the First Crusade: 1095-1099." NACOGDOCHES, Texas - The Stephen F. Austin State University School of Honors will host a lecture by its former director, Dr. Allen Richman, professor emeritus of history, at 3 p.m. March 13, in the McKibben Education Building, Room 131. Richman, the 2006-07 Regents Professor, will present "For Faith and Fortune - The Significance of the First Crusade: 1095-1099." He will discuss the history of the crusade and its lasting significance on the world. Dr. Michael Tkacik, School of Honors director, is excited to have Richman back on the SFA campus. "[Richman] is an engaging lecturer, one of the best I've ever seen," Tkacik said. "He is entertaining even as he covers his subject matter in scholarly detail. I think this event is a great opportunity for current students to hear from one of SFA's most skilled professors emeriti." Richman began teaching at Stephen F. Austin State College in 1965. 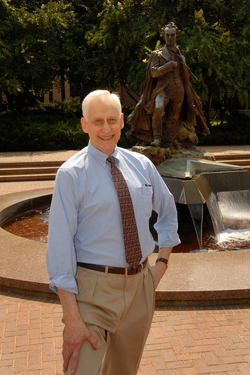 He was among the original organizers of the School of Honors program. "Allen played a central role in institutionalizing the School of Honors as well as dramatically increasing its size," Tkacik said, "but his students will remember him most for being a caring advisor who helped them achieve their dreams." This event is free and open to the SFA and Nacogdoches communities. Refreshments will be provided. Contact Jennifer Crenshaw in the SFA School of Honors at (936) 468-2813 or jmcrenshaw@sfasu.edu for more information.